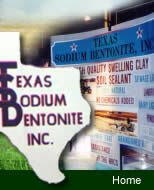 We mine and produce high quality sodium bentonite clay. This unique clay will generally swell to double its own dry volume when it comes in contact with moisture. Our products are 100% natural and do not require any chemicals or additives to enhance this clay's swelling capabilities, therefore this clay is non-toxic to birds, fish, wildlife, livestock or humans. We produce six different screen size granular products used in various markets. 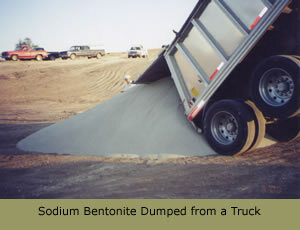 Our products are sold in bulk truckloads delivered in end dump trailers - approximately 23 tons - directly to pond sites, in super sacks, commercial bags weighing approximately 3000 pounds each with four straps on the top of the bag and a spout on the bottom of the bag for easy distribution, and in 50-pound bags. Bagged products are sold by the bag, by the ton, and by the 22.5-ton truckload. On order of a ton or more, the bagged products require a front-end loader, forklift, or tractor with forks on the front to unload this product upon delivery. The key to successfully using sodium bentonite clay to seal a pond is to use the recommended quantity based on the size of the area you intend to treat and the type of soil you are working with and to apply the product properly. Apply the product evenly being careful not to leave any voids, over the area you choose to treat. Then regardless of the application method you choose to use; the blanket method or the mixed blanket method, compact the area after application when possible. Our basic recommendation is a 1 inch thick layer (approx 8 pounds per sf) depending on the onsite material.